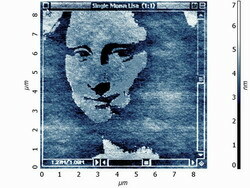 * We made a special "survival" test - almost 50 LAO Lithography images of Mona Lisa were obtained by using only one tip. It was not destroyed even after such a hard work. After 50 attempts it was still "alive". 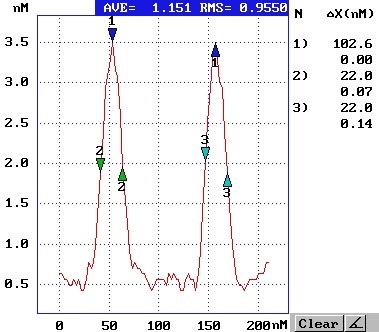 Semicontact mode by NSG20 probe with conductive diamond coating. NTEGRA Aura system. Scan size: 8x8µm. The thickness of lithography line was measured after the "survival" test. Noncontact Diamond Coated Conductive Probes DCP20 series, resonant frequency 260-630kHz, force constant 28-91N/m. Stable and nondestructive, wear resistant probes with conductive diamond coating allow you to make as many images as you want. The ideal probes for making AFM Oxidation Nanolithography. Noncontact Diamond Coated Conductive Probes DCP10 series, each chip has 1 cantilever, resonant frequency 190-325kHz, force constant 5,5-22,5N/m. Noncontact Diamond Coated Conductive Probes DCP01 series, each chip has 1 cantilever, resonant frequency 115-190kHz, force constant 2,5-10N/m.